A spectacular matte engagement ring channel set along one side of the top with 28 brilliant cut diamonds having a total diamond weight of 0.14ct. Diamond clarity is VS and colour is F-G. 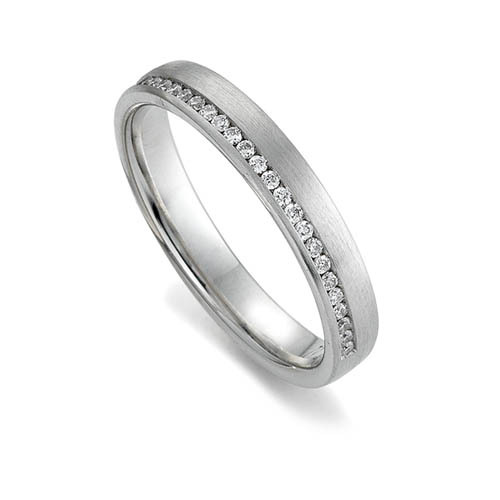 The upper surface has the most gentle of curves and the inside of the ring is rounded for a comfortable fit. Depth is 1.6mm and the width is 3.5mm. Available in 9ct and 18ct white gold, palladium 950 and platinum 950. Sample service available.Also available in rose or yellow gold - please contact us.